Here's a recap with updated, way more detailed info on what needs to be done when performing this specific type of B-series swap.. Please note this is mainly geared for 5-speed vehicle swaps, not so much Auto to 5speed conversions (I don't have much experience with auto to 5spd conversions!). Whether you are swapping in a B16/B18/B20vtec etc, make sure you get the correct engine mounts/shift linkage/axles! - rear engine "T" bracket - Note: Integra "T" bracket pushes the motor forward a little too much, thats why a 99-00 Si or JDM EK4/9 "T" bracket is best to use. - left side (driver side) dual-post engine block mount (only needed if going B18 - all B18 engines come with a 3-post right side mount). You can actually stick with a B18 3-post mount if you purchase a Hasport EK right-side driver replacement mount. Hasport offers 2 and 3 hole driver side mounts if you'd like to completely eliminate the OEM liquid filled mount that usually tears and leaks at some point or another in its life. If you want to retain your A/C compressor, pick up a "P54" 94-97 Delsol DOHC VTEC a/c bracket or a CRV a/c bracket. Both support the smaller civic a/c compressor. Shift Linkage: For 96-00 EK the chassis, I highly recommend to use a 99-00 Si or JDM EK4/9 shift linkage. I recently found out 94-01 integra shift linkage will not center the shift lever in the center of the shift boot area. Shifting to 2nd/4th gears the shift lever sits too far back hitting the inner edge of the shift boot console border. Axles: You can use any axles from these vehicles: 94-01 integra (JDM or US) all 5spd models, 99-00 Si, 94-97 DOHC delsol. Depending if you own a non-VTEC or VTEC model EK civic you can and should reuse your existing EWH (or run a 96-98 EX 5spd EWH). You cannot use an OBD1 EWH in an OBD2 civic. OBD1 EWH's are totally incompatible because of their 2-piece design. All EK civics use a 1-piece EWH design. 1-piece means the harness has NO break off points; wiring starts from the ecu plugs, leads through the firewall, and out to the engine seamlessly. If you have a non-vtec civic you will have to perform these mods to your EWH in order to be compatible with an OBD1 VTEC engine: (1) add VTEC wiring (2) wire in the KS (3) *perform the IACV mod. If you own a VTEC civic such as a 5-speed EX model you're lucky...almost. Using this EWH is way handy because all of the mods mentioned above are already embedded into this harness from the factory. The only downside is that 2nd 02 sensor wiring is not part of this harness, but part of the cabin harness in an EX. So, if you plan to run a US OBD2 ecu to power the OBD1 engine, you will need to manually wire in the 2nd 02 sensor. Fun fun. Now, if you plan to use an OBD1 ecu, no need to wire in the 2nd 02 as OBD1 ecu's do not look for a 2nd 02. For those non-VTEC civic owners who are weary of wiring, I suggest locating and using a 96-98 5spd EX EWH in your non-VTEC civic. It's totally compatible with non-VTEC 96-98 EK chassis's. Make sure you pick up a 5-SPEED EX harness and not an AUTO EX harness. Auto EX harnesses are wired slightly different and will not allow your car to start. I have yet to figure out why. 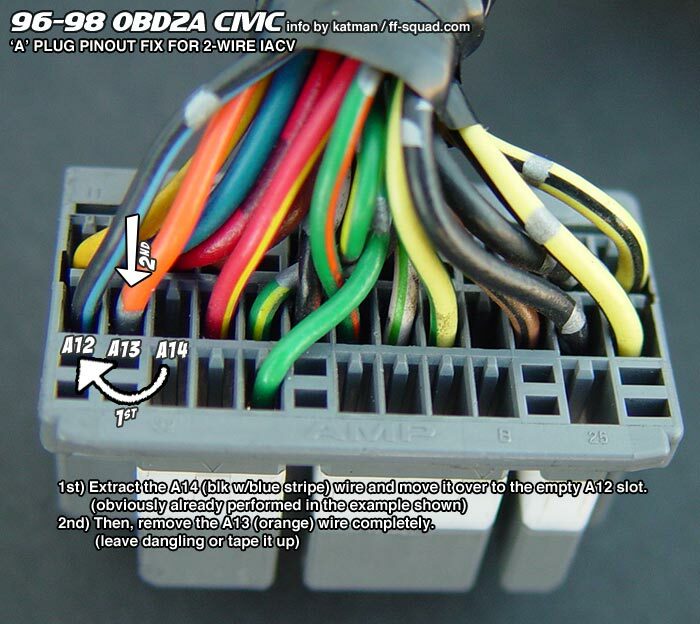 Convert to OBD1 dizzy plugs by cut/splicing OBD1 dizzy plugs and mating them to your OBD2 EWH, color matching the wires - or - find yourself an OBD2 B-series VTEC distributor (any 96-00 B-series VTEC dizzy) which will PnP to your 96-98 EWH (easiest option). Convert to OBD1 injector plugs by cut/splicing OBD1 injector plugs to your OBD2 EWH, color matching the wires - or - find yourself a set of OBD2 injectors (any 96-00 injectors, B-series to be specific, but D-series will work too) which will PnP to your 96-98 EWH (easiest option). I believe you can use your D-series alternator plug in the OBD1 B-series alternator, but don't quote me on this as I haven't quite tried this mod yet. 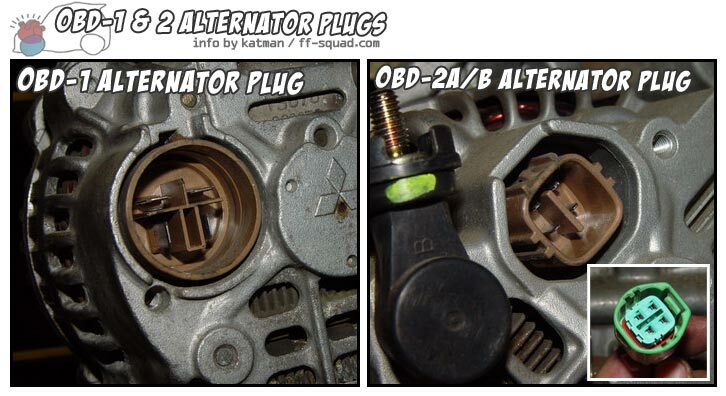 Your OBD2 IAT sensor plug is different than that of an OBD1 IAT. So, you can either keep your existing IAT sensor and make it work by making a hole in the intake arm. Or you can cut/splice the OBD1 IAT plug and mate it to your EWH so you can use the OBD1 IAT sensor thats located on the intake manifold runner. Once you perform this mod, you'll be glad to know that you can actually pass smog checks if your civic is B-series BAR'd or if you're running an OBD1 engine in an OBD2 integra for instance! You have 3 options in this department. Starting from easiest to hardest..
Run a JDM OBD2 ecu. CONS: OBD2 ecu upgrades are scarce; will not pass smog with a JDM OBD2 ecu as they do not communicate with US OBD2 scanner tools; 115-120mph speed limiter. Convert to OBD1 ECU via OBD2a&gt;OBD1 jumper harness and simply use an OBD1 ecu (JDM or US) to power the engine, such as a reprogrammed P28. PROS: OBD1 ecu's rule in general as they are easily reprogrammable and do not look for additional sensors (2nd 02 & CKF for instance). OBD1 ecu's are very forgiving and not as sensitive as US OBD2 ecu's are. CONS: cannot pass smog, VTPS required to be wired in. Stay US OBD2 spec by using a 96-97 DOHC VTEC Delsol P30 ecu; 96-99 Integra P72/GSR ECU; or 96-98 P73/ITR ECU. 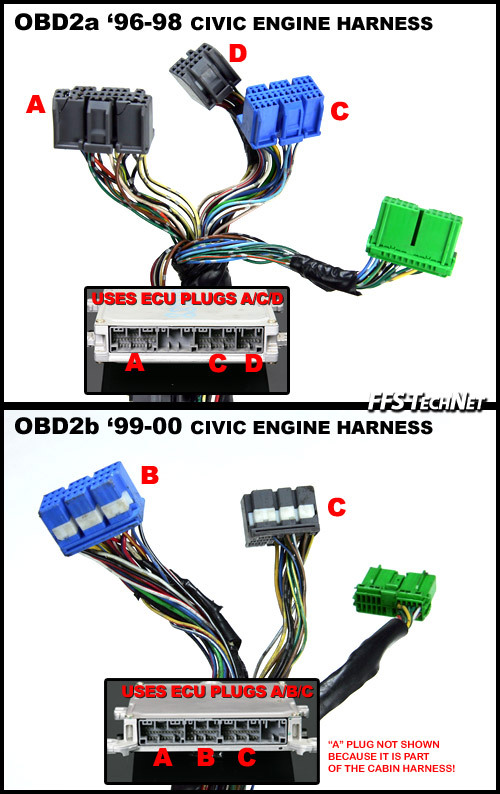 Convert to OBD2b spec via OBD2a&gt;OBD2b jumper harness and use a 99-00 Civic Si ECU. PROS: Can pass smog if CKF bypass trick is successfully performed in an integra or Civic Si chassis. If your Civic cx/dx is B-series BAR'd you should be able to pass smog too. CONS: 2nd 02 needs to be wired in and working. Engine info for 96-98 civic can be applied. Wiring info is simliar to that of 96-98 civic but slightly different. If you have a non-vtec civic you will have to perform these mods to your EWH in order to be compatible with an OBD1 VTEC engine: (1) add the respective wiring for VTEC (2) wire in the KS (unless you plan to use a P28 ecu) (3) *perform the IACV mod (4) change your dizzy plug to that of a 99-00 Si, 96-98 civic, or 96-01 integra large sized dizzy plug. For whatever reasons, Honda switched to a smaller style dizzy plug on all 99-00 SOHC civic's. This plug has to be changed if you plan to reuse your SOHC EWH on the OBD1 engine. 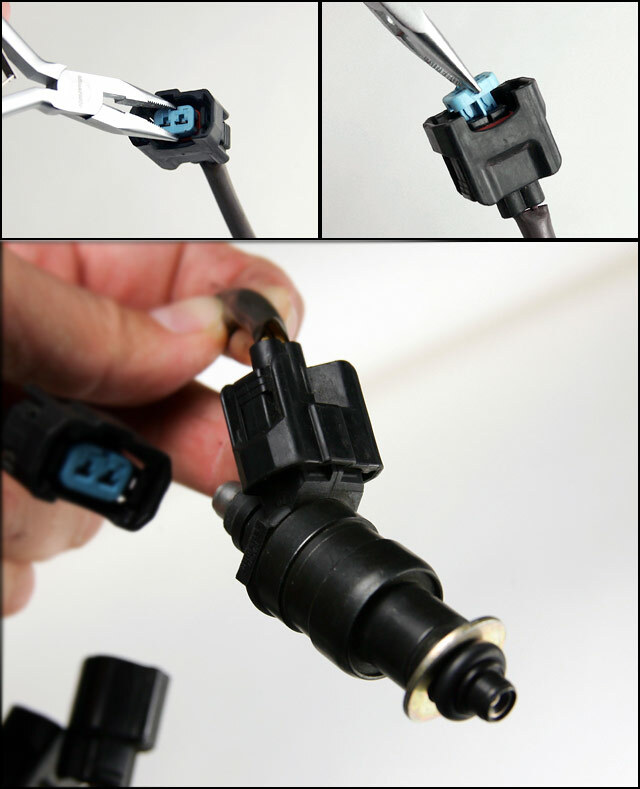 You'll need a 99-00 Si dizzy plug or a 96-98 dizzy plug that you'll need to depin and mate to your 99-00 CX/DX EWH. As an optional choice its highly suggested to fully switch over to a 99-00 Si EWH which in contrast is simliar to using an EX harness in a 96-98 civic. But again, the 2nd 02 sensor is part of the Si's cabin harness. So you will have to manually wire in the 2nd 02 if you ultimately plan to use a US OBD2 ecu. Wiring info from 96-98 civic can be applied. PROS: This is the easiest solution as this ecu plugs directly into your 99-00 EK, but you will need to perform the CKF bypass trick. Will be able to pass smog depending on certain variables. 99-00 Si ecu is compatible with US OBD2 scanner tools. CONS: CFK bypass trick is required; OBD2 ecu reprogramming is very scarce; 2nd 02 sensor required. CONS: OBD2b&gt;OBD2a jumper harness is required ecu upgrades are scarce; will not pass smog with a JDM OBD2 ecu as they do not communicate with US OBD2 scanner tools; 115-120mph speed limiter. Convert to OBD1 ECU via OBD2b&gt;OBD1 jumper harness and simply use an OBD1 ecu (JDM or US) to power the engine, such as a reprogrammed P28. Run a JDM OBD2 ecu via OBD2b&gt;OBD2a jumper harness. Or run a JDM CTR (PCT) ecu which is OBD2b spec and will PnP. PROS: CKF bypass trick is noCan pass smog if CKF bypass trick is successfully performed in an integra or Civic Si chassis. If your Civic cx/dx is B-series BAR'd you should be able to pass smog too. CONS: Requires OBD2b&gt;OBD2a jumper harness; Cannot pass smog; speed limiter at 115-120mph. Reuse existing EWH and follow wiring info for 96-98 civic for 96-99 Integra's or 99-00 Civic for 00-01 Integra's. You can actually use a US OBD1 engine wire harness in a 96-01 integra. You heard me right. 96-01 Integra's all retain a 2-piece wire harness design. Honda thankfully made the break off plugs backwards compatible with OBD1 EWH's. Just make sure that if you own a non-VTEC integra that you have VTPS, VTS, and the KS wired in from the ecu plugs out to the shock tower plug and you'll be golden. Note: 96-01 OBD2 integra's all have the 2nd 02 sensor integrated into the cabin harness, so there's no need to wire in a 2nd 02 sensor at all for 96-01 integra's. 00-01 Integra ecu's are immobilizer equipped and cannot be swapped around unless the IMM is removed. - (96-99 Integra) JDM OBD2 ecu (direct PnP). Same PRO/CONS as 96-98 civic w/JDM ecu. - (00-01 Integra) JDM OBD2 ecu (OBD2b&gt;OBD2a jumper harness required). Same PRO/CONS as 96-98 civic w/JDM ecu. - (96-01 Integra) OBD1 ECU conversion; same PROS/CONS as 96-00 civic OBD1 conversion. - (96-99 Integra) OBD2a US ECU; PnP; same PROS/CONS as 96-98 Civic. - (00-01 Integra) OBD2a US ECU; same PROS/CONS as 99-00 Civic. - (96-99 Integra) OBD2b US ECU; OBD2a&gt;OBD2b jumper harness required; 00-01 integra ecu will need to have the immobilizer removed in order for 96-98 Integra to run. Wow. this was extremely exhausting to write up. Hope people find this informative and not too confusing! Although I think the whole optional ecu part of the swap may be a bit confusing for some. If I find errors in this post I will fix them! Anything not covered here, please add to the list. I will be updating/revising this thread for up-to-date and accurate information as possible.